My best movie is now "3 idiots"
My second best movie is "the world's fastest Indian." 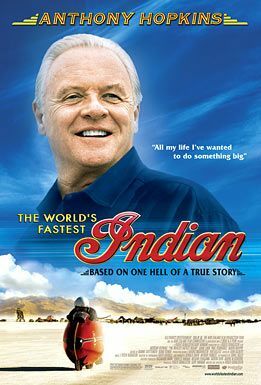 The movie is based on the real story of Burt Munro. He is old Kiwi, He brought his bike to U.S. No one believed his old bike could run fast, but He broke the world's record. He always gets over with humour and earnest. I don't care of how fast at all. Slower is better, I love to ride a bicycle. However, he pursuits speed and before I knew I cheered him. People gives others trouble, but an important thing is a gratitude and apology. Although Burt is not a perfect man, he has these attitude. Therefore many people want to help him. I don't think "Everyone can achieve their dream". He is crazy at speed. He loves to ride a bike. In the movie, an Indian asked Burt. "What do you want to ride that contraption for?" "Well...I guess the reward is in the doing of it." I think the story is valid if he doesn't achieve the fastest. He is already satisfied on the way to be fastest. This is the point. He loves to do that. The result comes after passion. The movie is the undisputed 5 stars.